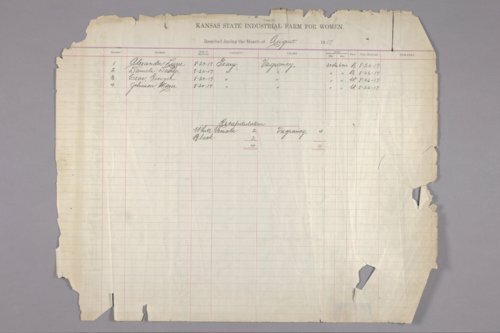 This ledger from the Kansas State Industrial Farm for Women provides information but is not limited to the inmate's name, number, race, crime, date and county of arrest. Arranged in chronological order by date of intake from 1917 to 1926. Additional volumes are available in the reading room. See also Unit ID 193822 for Inmates discharged register.